Today will be a first for Idyll Time. 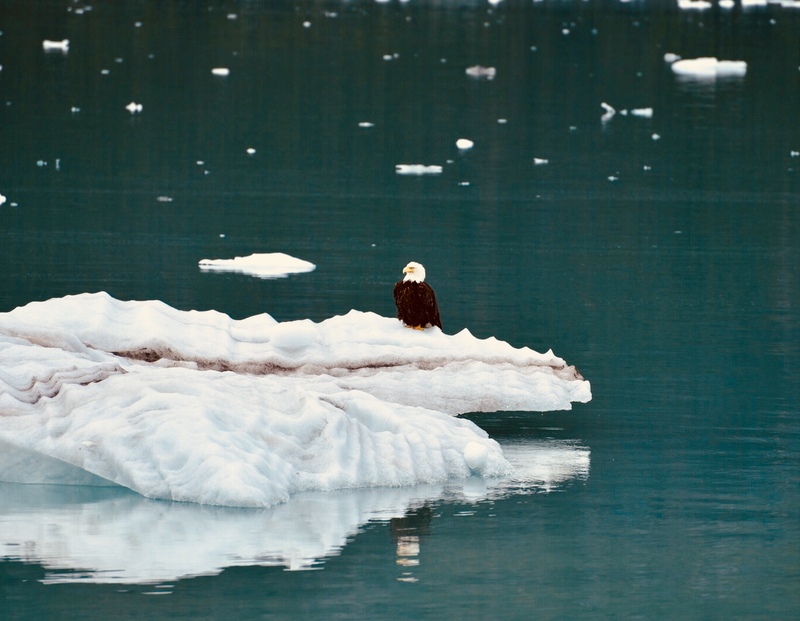 After traveling 65 miles up bay, we are heading to the glaciers and are a little nervous about navigating through ice. We have never done this before. Striking an ice berg would be just like hitting a rock and could do much damage to Idyll Time. We are truly on our own in these remote waters. “Adventures” traveled to the glaciers yesterday and was able to navigate within a few miles of the glaciers face. The ice changes daily so we will see how far we get. 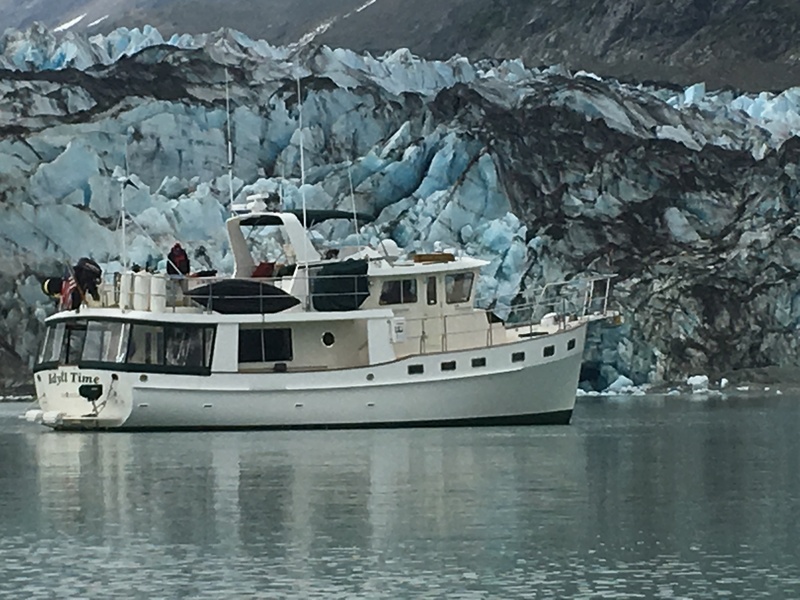 Our first stop is Lampough Glacier just a few miles from our anchorage. We take advantage of the calm seas for a Kodak moment. 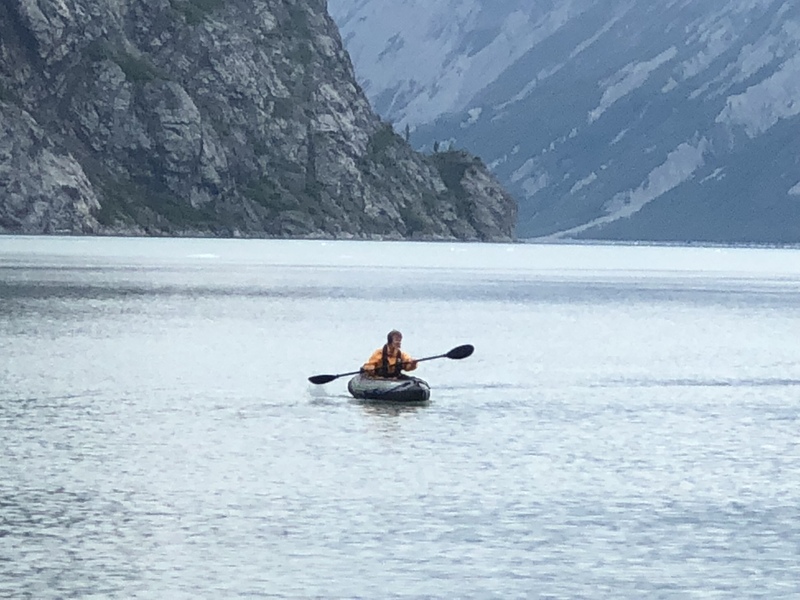 Susie is deployed in the kayak to get some pictures of Idyll Time with the glacier in the backdrop. Jeff, Jack, and Barbara watch nervously as Susie paddles out among the icebergs to get the right picture. 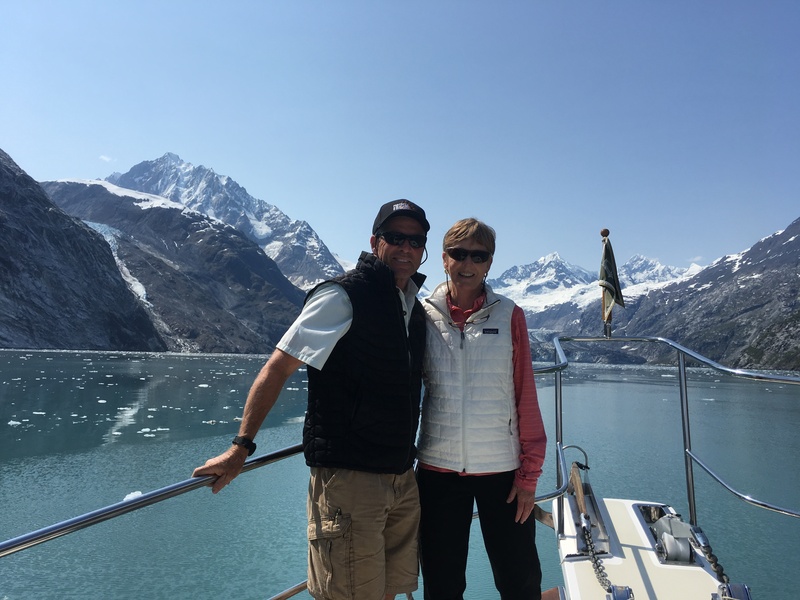 After our photo op and Susie is safely back aboard, we travel eight miles up Tarr Inlet to view the Margerie and Grand Pacific Glacier. 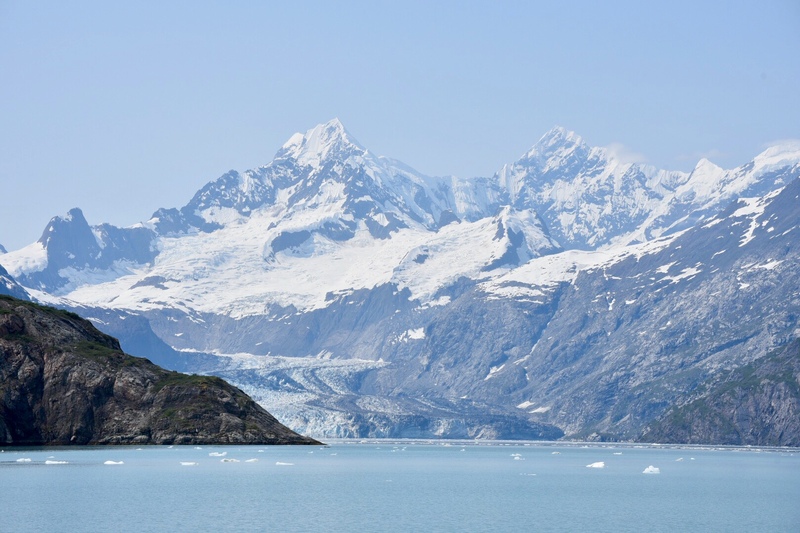 These two glaciers were joined until 1912 when the Grand Pacific retreated into Canada. In 1948 it again moved across the border into Alaska and the two are now rejoined. 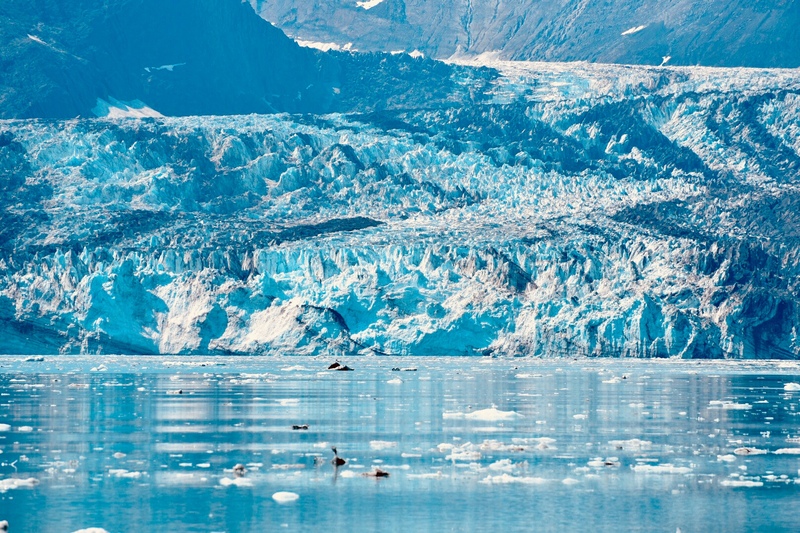 The Grand Pacific Glacier is the predominant glacier that is responsible for carving Glacier Bay. Today this glacier is mainly rock covered with very little ice showing but we know there is ice there as the channel is chocked with mini ice bergs. We slowly weave our way through the ice towards the glaciers. No other boats have been here today. We wonder where the cruise ships are? There are usually two here each day. Having to navigate around a large cruise ship and the ice would have been a little more difficult, although the ship would probably have plowed a path for us. We motor within three miles of the glaciers before the ice completely blocks our path and we gently retreat. 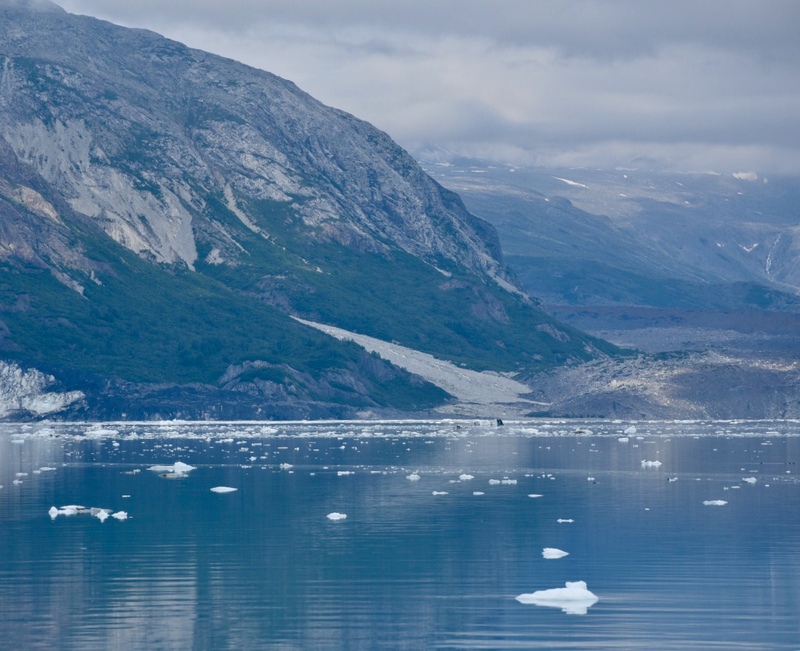 We next travel up John Hopkins Inlet to the John Hopkins Glacier. Until just a few days ago, this Inlet was closed to boaters due to seals calving on the ice bergs. The cruise ships are allowed only part way up the Inlet to Jaw Point. There are no cruise ships today and we are again the only boat in the Inlet. We carefully maneuver our way through the ice for over an hour reaching to within two miles of the glacier. We spend the next hour just hovering as we take in the scenery of this magnificent place. Every few minutes we hear some loud booms coming from the glacier. We don’s see the calving but do feel it as Idyll Time sways up and down with the gentle swells from the calving aftermath. The ice is constantly moving in a gyre type path so we must be vigilant on watching for encroaching ice burgs. It is a magical experience floating amongst the ice in this beautiful spot. We have seen a lot of sights over the past 12 years and 30,000 miles of travel in Idyll Time but this has to be the most incredible spot we have ever visited. The glaciers have a spirit all their own and this is an awesome experience we will remember for many years. After spending an hour at the glacier, we carefully retreat towards our anchorage at Blue Mouse. 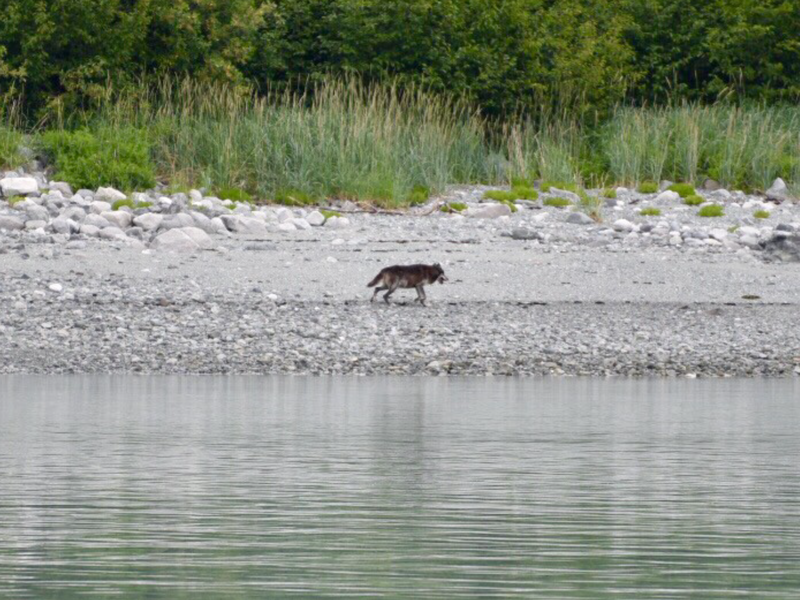 We spot a lone wolf along the shoreline. For the next thirty minutes we slow the boat and pace beside this beautiful creature as she trots along at 4 mph. Our presence does not seem to bother her one bit. 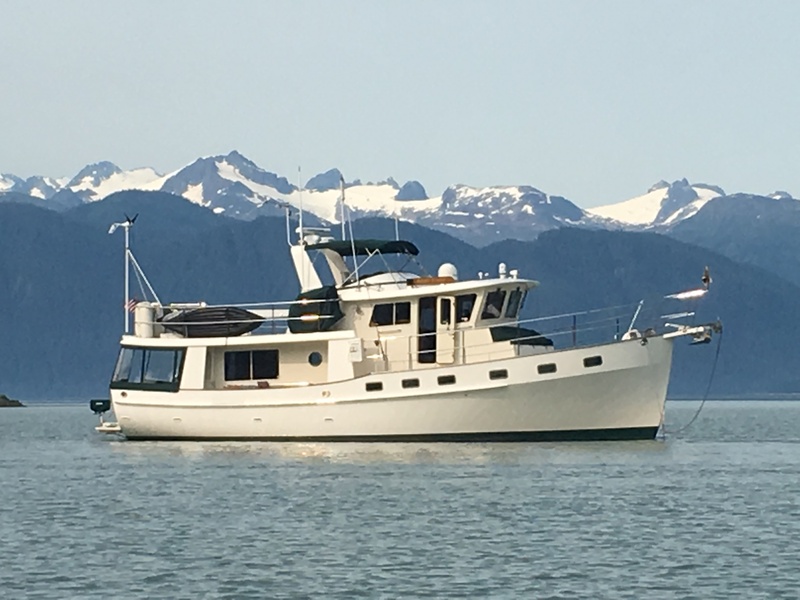 Blue Mouse is another great anchorage with beautiful views. We share this spot two other boats. This entry was posted on August 25, 2018 at 2:39 pm. You can follow any responses to this entry through the RSS 2.0 feed. You can leave a response, or trackback from your own site. 1 Response to "Into the Ice"
Hello Jeff & Susie. We met you in Nanaimo campground when you stopped by to inquire about our Motorhome which was like yours – the View. I am in awe seeing your pictures and following your travels. This is better than Lonely Planet! The knowledge and expertise you must have to plan a trip like this is incredible. I congratulate you on your courage. What a beautiful boat. thank you for allowing us to travel with you. Safe travels. Carole & Ron.